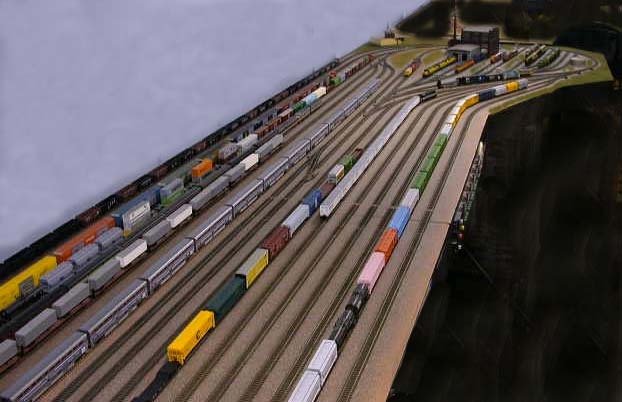 The Lincoln N-Scalers made a large, off-line yard with 12 storage tracks. 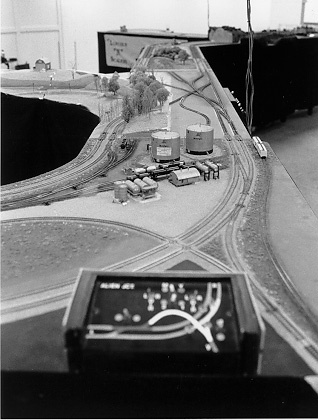 To connect the yard, they made a yard inlet module which is an "L" shaped module, seen in the upper left photo. You can see the control panel that is easily accessible in the top of a building. 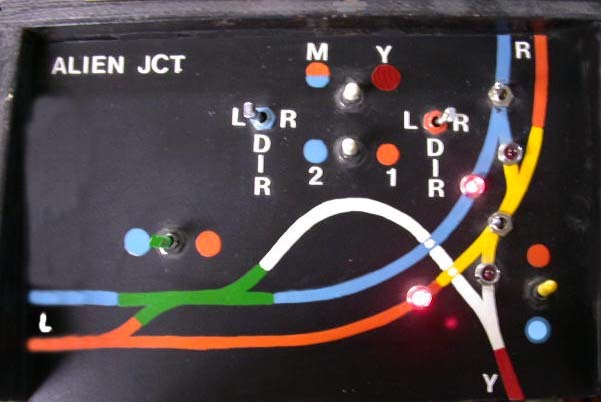 The panel uses switches laid out on top of a schematic of the track. 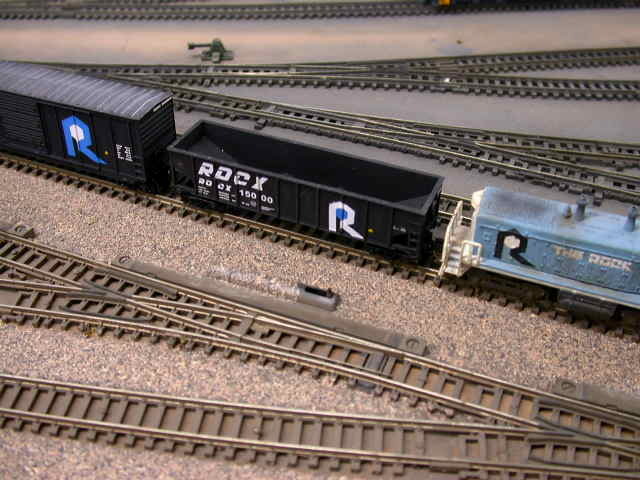 This helps newcomers learn to use the yard/mainline interchange rapidly. In the second row of photos, you can see the Inlet module. The yard is off to the right of the photograph. This picture gives a good view of the track plan that allows a train from either main line going in either direction to pull straight into the yard. 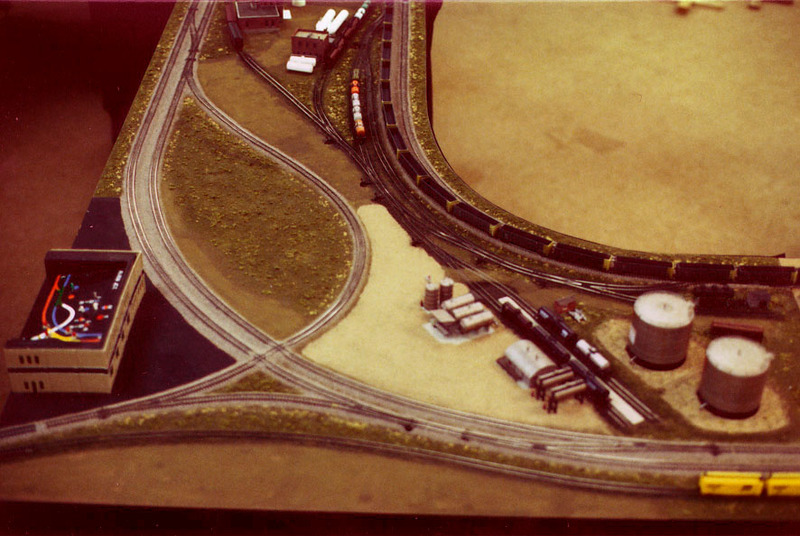 The yard itself has a turn around loop at the far end allowing the train to be turned and come out engine first onto any track in either direction. The photo on the right was taken from inside the operating "pit" created by the yard and the modules. Farther down the line you can see part of Jim Hoover's N-Trak conversion module. Off to the left of the picture the N-Trak branch projects. The spaghetti of track work you see allows a train from either main to cross over to the other main in either direction. It also allows operation where the two mains effectively become one long main with the train traveling the entire route on one main and then crossing over to the other to travel the entire length of that main. In the third row of photos, you'll get to see the whole set of modules and the operating "pit" that the design allows. 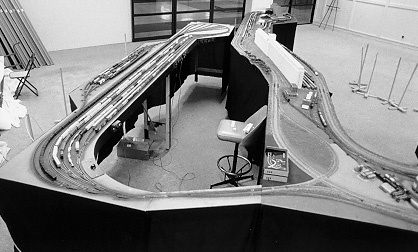 This yard was the initial version, and underwent a serious redesign for the 1997 NMRA Meet. Check out the next batch of photos below! 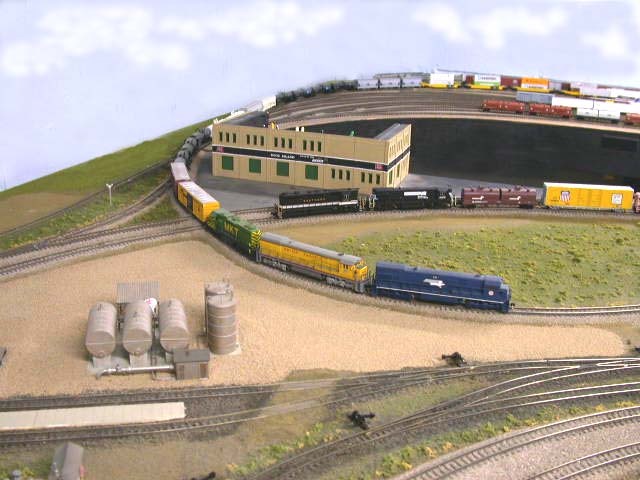 This is the "New Yard", completely rebuilt in 1996 in preparations for the 1997 Lakes Junction NMRA meet in Madison, WI. Now it has twice the capacity of the yard in the "Mall setup" photos. (B&W top of page) It can hold sixteen trains averaging 35 fifty foot cars each plus the power, that's about 600 cars! 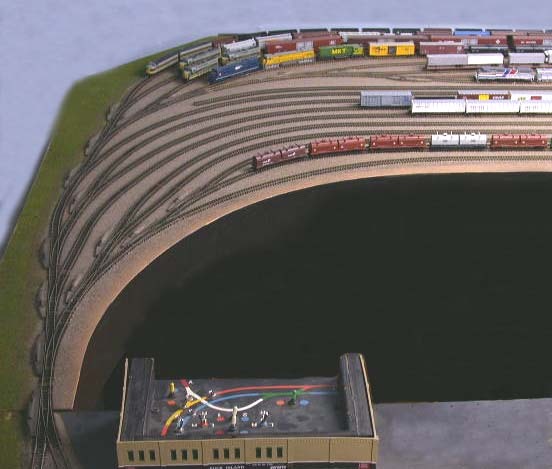 The engine terminal can hold close to 60 diesel locomotives. The yard measures 16' long, 46" wide at the balloon end, and 29" wide in the middle. The yard can be dismantled into four 8' sections for ease of transportation. There are over 150 pieces of Atlas flex track, 52 turnouts and about 400' of single conductor wire. The yard is a large loop with two separate sub yards divided down the middle by two tracks which are the reverse/bypass block. We use these for turning whole trains or locos before returning to the mainlines. They also double for switch leads for each of the sub yards. The far end of the yard is still made up of a compound ladder for both sub yards. Each sub yard is made up of eight tracks each! 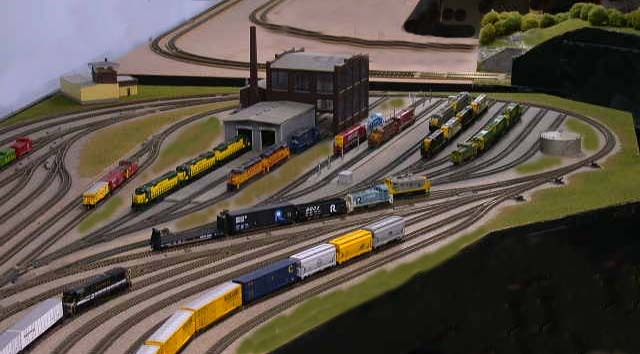 Having a yard this large not only allows members to build and tear down trains "off the mains", it also permits quick and frequent train changes to keep things interesting on the mainline during public shows. The public seemed just as interested in the "workings" of the yard and inlet module as they did watching the trains cover the miles on the main portion of the layout. Just as a side note, if we were to ballast the entire yard, not only would we have to secure a small loan for the ballast, I doubt we could begin to lift it! What we came up with, was SPRAY ON ballast! Be sure to check out the "Tips & Tricks" page to check out our technique! In the second row of photos, you can see the Inlet module. The yard is off to the right of the photograph. This picture gives a good view of the track plan that allows a train from either main line going in either direction to pull straight into the yard. 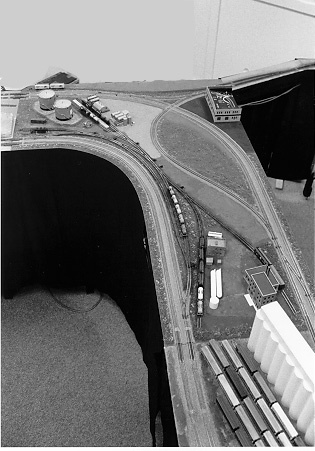 The yard itself has a turn around loop at the far end allowing the train to be turned and come out engine first onto any track in either direction. The photo on the right was taken from inside the operating "pit" created by the yard and the modules. Farther down the line you can see part of Jim Hoover's N-Trak conversion module. Off to the left of the picture the N-Trak branch projects. The spaghetti of track work you see allows a train from either main to cross over to the other main in either direction. It also allows operation where the two mains effectively become one long main with the train traveling the entire route on one main and then crossing over to the other to travel the entire length of that main.